Monarch Garage has over 30 years of experience dealing with Land Rovers; all our staff are highly skilled and consistently work to the highest professional standard. At Monarch Garage, we are passionate about Land Rover, as a brand and as a vehicle, and this passion translates to our work. Our mechanics work hard to ensure your vehicle is returned to you on time, free of any problems, and running as smoothly as the day you got it. Our Service Advisors make sure you are kept up to speed with everything that is happening to your car, as well as providing reminders about upcoming services and MOTs. We pride ourselves on offering the best customer service possible, our attention to detail, expert knowledge, and dedication really set us apart from other Land Rover garages. 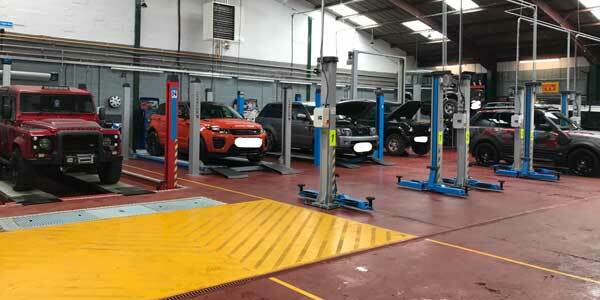 Monarch Garage offers a wide range of services including specialist Land Rover and Range Rover car servicing, MOTs, repairs, refurbishments, restorations, and upgrades. At Monarch Garage we have the latest official Land Rover Diagnostic Equipment, Pathfinder, Autologic systems, and full servicing facilities. Our brand-new, fully equipped garage boasts all the best and latest in technology and tools for the servicing and repair of Land Rover and Range Rover vehicles. As an independent specialist we deal with all Land Rover and Range Rover models including (and not limited to) Land Rover Defender, Land Rover Discovery, Land Rover Freelander, Range Rover, Range Rover Evoque, as well as dealing with Series models. 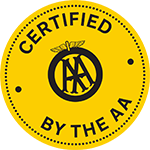 Warranties are protected by Monarch Garage. With their Land Rover expertise, they are able to offer advice about suspension and brakes so that your vehicle is properly equipped for the road, track or muddy field. Monarch also provides an extensive range of servicing and performance options for other makes of car, and pride themselves on their high levels of customer service and satisfaction, carrying out engine servicing, MOT preparation and testing, repairs, diagnostics, refurbishment and restoration of all makes of Land Rover / Range Rover. Monarch Garage is covered by the European Law known as "Block Exemption" which means that as an Independent Land Rover and Range Rover specialist we can carry out Land/Range Rover service without making your warranty invalid. 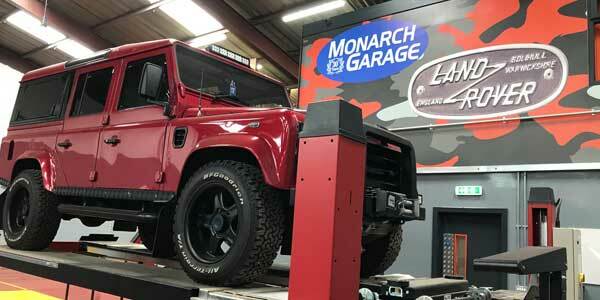 Monarch Garage is equipped with Dealer-level Land Rover/Range Rover diagnostic and servicing tools alongside Land Rover Topix online servicing records and Land Rover security credentials for key programming. Monarch Garage also offer 4x4 infrared tracking systems & Air Con servicing. John Taylor always has one eye looking to the future and takes great pride in passing on his knowledge and expertise to apprentices working with Monarch Garage and making their way in the trade. One highly effective way of doing this is to have the apprentices deeply involved in all aspects of the special project restorations carried out by the company.